Pest Management Professional (PMP): So, after I declined to conduct this interview in the bedroom of my apartment, you stopped returning my calls. What changed your mind? 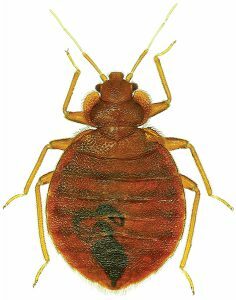 Bed Bug (BB): [sighs and removes sunglasses] My publicist, Peggy. She’s worried I’ll fall off people’s radar. BB: That’s what I said! But whatever. Let’s get on with it. PMP: So … um, what’s new? BB: I’ll tell you what’s new! Nothing! My reign as King of All Pests rolls on. I’m the greatest pest to ever live! PMP: You sound like Muhammad Ali. BB: [smiling smugly] If the shoe fits.You know, I’ve been a known parasite for thousands of years. BB: Yeah, but my kind were pretty much eradicated from your “developed world” in the 1940s. PMP: Well, there were methods at our disposal then that aren’t available to us now. PMP: You began your comeback, when exactly? BB: Well, we started becoming more prevalent again in the late 1990s — for the reason you cited and your species’ penchant for international travel. We also enjoy traveling. PMP: Don’t you mean hitchhiking? PMP: I guess the big question is, why us? Why turn human lives upside down? I mean, you realize you’ve caused thousands of people a lot of stress and unhappiness, and cost them a lot of money. BB: We don’t bite. We just kind of plug you. Our mouthparts saw through your skin. When we feed on a host, we think of it as a give and take. BB: We inject you with our saliva containing anticoagulants and painkillers. [The pair sits in silence as BB waits for PMP to react. PMP does not.] We’re trying to make this easy on you. We don’t have to provide the painkillers. PMP: Biology dictates, that yeah, you kind of do. PMP: But how do you find us? How do you find our beds? BB: As long as you’re breathing, you might as well be sleeping under a flashing neon sign that says “Eat at Joe’s.” It’s the carbon dioxide you give off when you exhale. Your warmth helps, too. PMP: You get us at our most vulnerable. That’s just one of the reasons you’re so hated. BB: Haters gonna hate. You’re a movable feast. If you’ve got problems with how we live, change your lifestyle. BB: I dunno… stop exhaling when you sleep? PMP: What’s your take on Zika? PMP: The Zika virus. It’s helped mosquitoes steal a lot of your limelight. You’re not quite the media darling you were a year ago. BB: So, yeah, the Zebra virus. Whatever. I refuse to let it make me insecure. And you, sir, would do well to remember we’re not disease vectors. PMP: Technically. As far as we know. But what about secondary infection from scratching your bites… or whatever you called them? BB: So, don’t scratch. Again, I fail to see how this is my problem. PMP: Could you indulge me and provide a little helpful information to those who don’t want to live with you? You’re pretty good at hiding until we doze off. How do we know if we’re living with the likes of you? BB: First of all, some of us hide better than others. Some hide in the seams of your mattresses., but that’s a good way to get caught. See that electrical outlet over there? That’s where I hide. PMP: So, how do we know when we have good hiders like you within feeding distance? BB: This interview is over. PMP: C’mon! Give me something. BB: Your blood! OK? Spots of your blood on your bed, sheets or whatever. BB: Spotting from our crap and the carcasses of our dead. Are you happy? PMP: [sighing] You’re right. I shouldn’t have asked.